(by Michael Rubinkam, The Associated Press (AP) — Pennsylvania Gov. Tom Wolf on Friday ordered counties that plan to replace their electronic voting systems to buy machines that leave a paper trail — a safeguard against hacking — but his budget doesn’t include any money to fund the replacement of the state’s aging, increasingly vulnerable fleet. The Democrat’s administration said the move to require that new systems include a paper backup will increase the security of voting systems and make balloting easier to audit. “This directive will ensure that the next generation of the commonwealth’s voting systems conforms to enhanced standards of…auditability and security,” Acting Secretary of State Robert Torres said in a statement. The state, however, is not requiring counties to discard their old equipment, at least for now. The directive only requires them to buy machines with a paper backup if they decide to switch systems. Nor does the Wolf administration’s budget plan , released this week, include any new money to help counties replacing their aging systems. 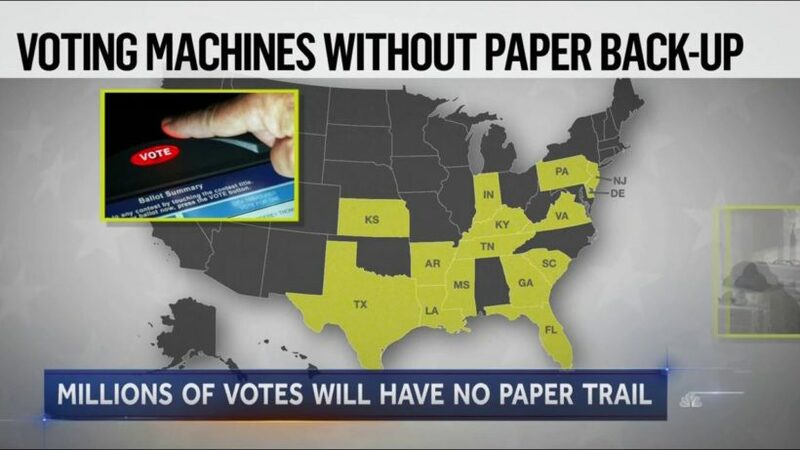 …..
Pennsylvania is one of 13 states where most or all voters use machines that store votes electronically without printed ballots or other paper-based backups that could be used to double-check the vote, according to researchers at New York University’s Brennan Center for Justice. So-called direct-recording electronic machines make it almost impossible to know if they’ve accurately recorded individual votes or if anyone tampered with the count. ….. Most Pennsylvania counties had replaced their voting machines more than a decade ago with money appropriated by Congress for election upgrades. With those machines at or near the end of their expected lifespans, the County Commissioners Association of Pennsylvania is pushing for state and federal funding to help counties buy replacements. New voting machines can run $3,000 apiece. The vast majority of Pennsylvania’s fleet of more than 20,000 electronic voting machines leave no paper trail, according to a 2014 tally by state election officials. Wolf’s Department of State said it has “made no determination” on whether it will eventually bar the use of the direct-recording electronic machines, raising the possibility that such a move is under consideration. A spokeswoman did not immediately respond to an email seeking clarification. Virginia banned the use of touch-screen voting machines in November’s gubernatorial contest over concerns the equipment could be hacked. The federal government in September told election officials in at least 21 states, including Pennsylvania, that hackers targeted their systems before the 2016 presidential election. At the time only Illinois reported that hackers had succeeded in breaching its systems. The U.S. Department of Homeland Security has said there’s no evidence that vote tallies or registration databases were altered. In 2006, voters filed suit against Pennsylvania to bar the use of paperless electronic voting machines, contending they were unreliable, lacked adequate safeguards against vote tampering and violated a state law requiring “a permanent physical record” of each vote. The state Supreme Court dismissed the suit, saying the plaintiffs had not shown that direct-recording electronic machines are more susceptible to fraud or tampering than other kinds of voting systems. From AP .com. First published Feb. 9, 2018. Reprinted here for educational purposes only. May not be reproduced on other websites without permission from The Associated Press. 2. What problem do Pennsylvania counties have in complying with Gov. Wolf’s directive? 3. a) In what two ways will voting machines that provide paper backup improve voting? b) How did Pennsylvania Acting Secretary of State Robert Torres explain the importance of Gov. Wolf’s directive? 4. A directive is an official instruction or order. a) What does Gov. Wolf’s directive require? b) What two things doesn’t Gov. Wolf’s directive do? 5. a) What are direct-recording electronic machines? b) How many states use these types of machines? c) What is the problem with these voting machines? 6. Most Pennsylvania counties replaced their machines 10 years ago with money from the federal government. County governments are now asking for state and federal funds. Government funding all comes from your tax dollars. Who do you think should pay for the machines? Explain your answer. 7. How important do you think it is for every state, county and municipality to use voting machines that have a paper record? Explain your answer. The types of voting equipment used in the United States vary from state to state. Visit the ballotpedia page for breakdown by state. Go to the National Council of State Legislators website for explanation on the three states that hold election by mail. Read about Voter ID laws by state at ncsl.org.